Usually silent in winter. 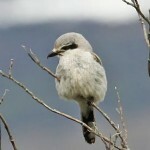 Song is a subdued, varying warble that often imitates other birds. Description: Sexes similar. Distinctly hooked bill, with pale lower mandible. Light gray above; white below with fine gray barring. 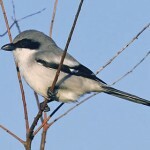 Broad black eye stripe (mask is narrower than in Loggerhead Shrike, and does not extend above eye and over bill); black wings and tail; white throat, rump, and outer tail feathers. Large white wing patches. Juveniles are browner overall with more pronounced breast barring, and a less defined eye stripe. Behavior: Kills more than it can eat, and stores it food by impaling prey on a thorn or barbed wire. On lean days it will eat from its larder. Habitat: Occur on open plains or prairies with scattered trees or telephone posts for perching. Where in Nebraska: Uncommon to locally common winter resident across the state. Perhaps more common in the west. 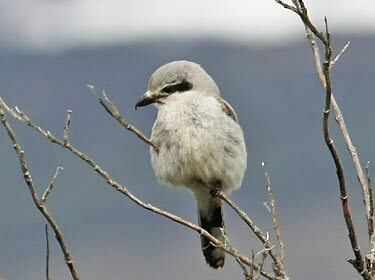 Fun Facts: The nest of the Northern Shrike is an open cup, but it is so deep that while incubating, the female is completely out of view except for the tip of her tail.